Although the Mesquite Canyon Hiking Trail is a bit long, its moderate slopes and gorgeous West Valley views make it a wonderful hike for both mini-me and other trail goers alike. Frolicking families (who make use of the park’s playgrounds and campsites) typically scamper and chatter over the first mile. Beyond that the trail becomes increasingly tranquil. Other than the clomping of an occasional “saddle bum” (since the rambling trail is popular with horseback enthusiasts) you’ll have the trail mostly to yourself. 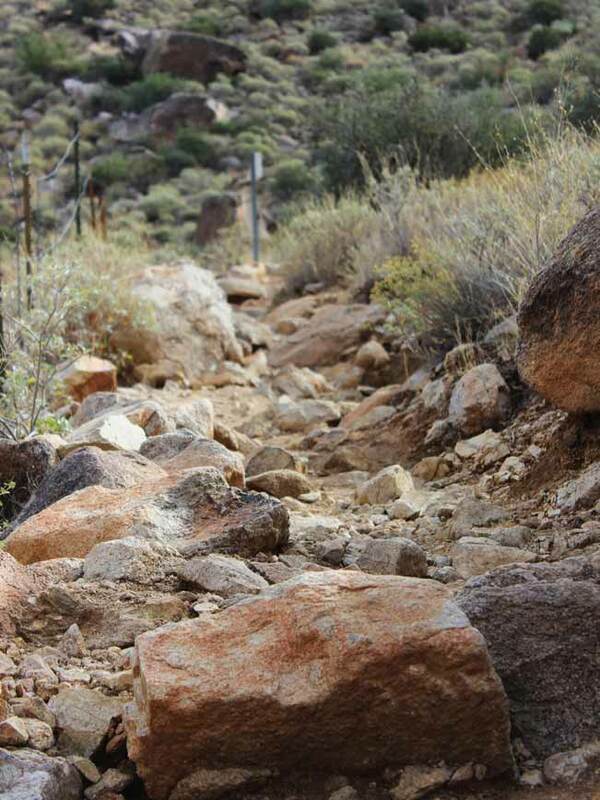 The Mesquite Canyon Hiking Trail starts out at a flat to minimal incline, traversing the base of the mountains. After about 1.5 miles it gets moderately stepper for a patch, ascending up the side of a craggy slope, where mountain views of granite, saguaro and cholla reign supreme. The trail is a bit rocky in this vicinity, but easily manageable with an eye to the ground in front of you (and a bit of heavy breathing as you ascend). An overlook located about 3 miles into the Mesquite Canyon Hiking Trail offers incredible views over the rural farming areas of Waddell, with Glendale and Phoenix glistening behind. 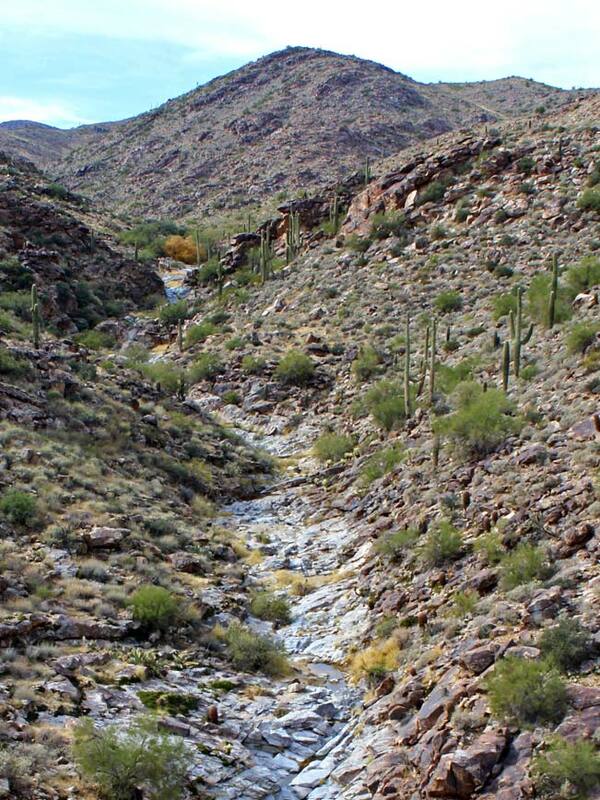 Further along gorgeous ravines appear, exposing the saguaro lined white “tanks” (or riverbeds) the range is named for. 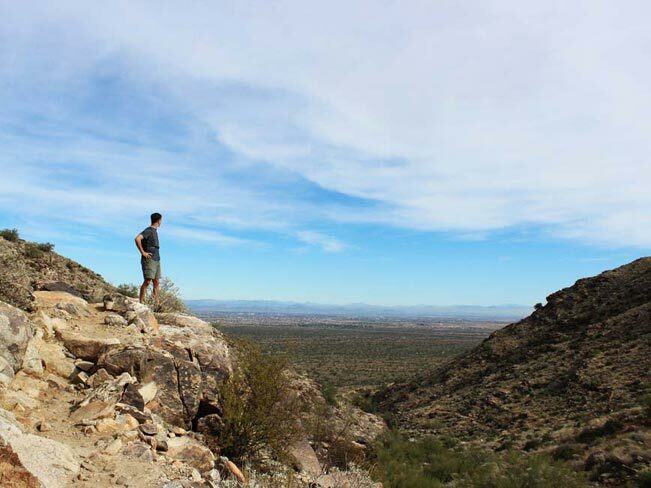 The Mesquite Canyon Hiking Trail can be hiked as an out-and-back or connected to the Ford, and then the Willow Canyon trails (with their own treasures and irresistible echo canyons) for a more loopy adventure. The “white tanks” have been formed over the millenniums as the runoff from heavy rains eroded the riverbeds and exposed the white granite rock which constitutes the base of this mountain range. Click here to download a map of the trail. Directions (North Phoenix) From the northern intersection of I-17 and AZ-101, take AZ- 101 west 13.5 miles to exit 9/Olive Avenue. Turn right/west on Olive Avenue and continue 13.8 miles to the entrance to White Tank Mountain Regional Park. Beyond the entrance continue on West White Tank Road to the trailhead parking lot on the right side of West White Tank Road – just past picnic area #4. (South Phoenix) From the southern intersection of I-17 and I-10, take I-10 west 18.4 miles to exit 124/AZ-303. Drive 5.3 miles to exit 109/Glendale Avenue. Turn left/west on Glendale Avenue and continue .5 miles to Cotton Lane. Turn right/north on Cotton Lane and drive 2 miles to Olive Avenue. Turn left/west on Olive Avenue and continue 4 miles to the entrance to White Tank Mountain Regional Park. Beyond the entrance continue on West White Tank Road to the trailhead parking lot on the right side of West White Tank Road – just past picnic area #4. Thanks Amber. So glad you like them.